WASHINGTON, D.C. – Today Congressman Walter B. Jones (NC-3) conveyed his concern over new signs that have been erected by the National Park Service (NPS) in Cape Hatteras National Seashore Recreational Area. In a letter to Mike Murray, Superintendent of the National Park Service Outer Banks Group, Jones points out that the signs falsely convey a level of restricted pedestrian access that goes beyond park laws and regulations. He goes on to ask the Superintendent to replace the signs. 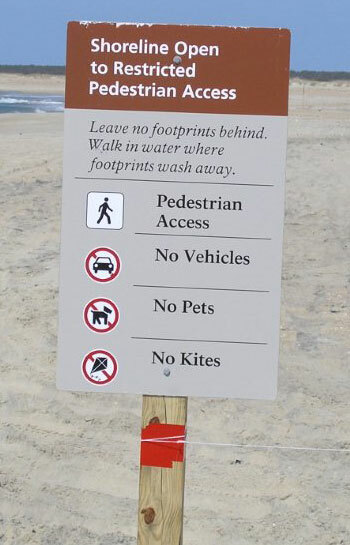 I am writing to convey my concern with new signs the National Park Service (NPS) has erected in several locations along the beach in Cape Hatteras National Seashore Recreational Area. I have attached a photograph of one of the signs for your review. Clearly, these signs do not reflect the level of accessibility permitted in the rule. The rule’s allowance for visitors to walk below the high tide line does not mean that visitors can only walk in the ocean. The final rule is already hurting Seashore visitors and nearby residents and businesses enough. They should not have to deal with additional restrictions not included in the rule. I urge you to promptly remove these signs and replace them with new signs that accurately convey the level of visitor accessibility spelled out in the final rule. If I can be of any assistance in securing this change, please do not hesitate to let me know. For additional information, please contact Catherine Fodor in Congressman Jones’ office at (202) 225-3415.